Paros is situated in the Cycladic group of islands, 100 miles southeast of Athens and is a jewel in the Aegean Archipelago. 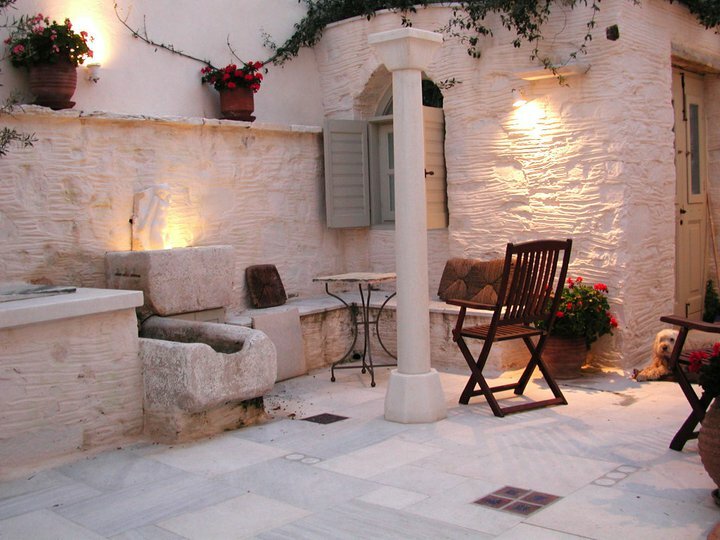 Partly because of its famous marble, Paros has been an important part of civilization since 5,000 BC. In island's main village of Parikia, where the school is located, houses and churches gleam brilliant white and the waterfront is lined with cafes and restaurants that look out across the bay toward the sunset. The Center's restored Neo-classical facility is located in the heart of Parikia on the old market street leading to the famed Byzantine Church of a Hundred Doors. Student apartments are a three minute walk from the Center off the very same market street. Our painting studios are clean open spaces with excellent natural lighting. Our digital photo lab is in a beautifully restored old merchant’s house next to our main building. The lab is a ten computer state-of-the-art and fully calibrated facility. Immensely consequential to our program design is the sense of place. For 50 years the Aegean Center has been a member of the life and texture of Paros and we are very proud to be a significant part of its very rich culture and history. Also, Paros is not just about the past and the ancient, it is a remarkably lively environment reflecting contemporary Greek culture and thought. HOUSING | FACILITIES | the CREATIVE PROCESS | F.A.Q.